Over 500 miles of US 93 are in Nevada, and the land it crosses is largely unchanging; usually the route passes along the floor of a wide valley while distant, jagged mountain ridges follow the road at either side. So it is with the stretch north of Caliente - a sleepy railway town close to the Utah border - but hidden just one mile to the west, close to the even smaller town of Panaca, is a unique landscape, created by erosion of soft shale and mudstone by rainwater flowing into the seasonal Meadow Valley Wash, an area known as Cathedral Gorge. The formations have been protected since 1935 when the gorge became a state park, one of the first four such places in Nevada. 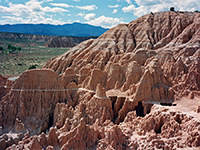 The park is 165 miles north of Las Vegas and 83 miles west of Cedar City in Utah. 'Gorge' is a slightly inappropriate term as nowhere do the branched ravines formed by the creek exceed a depth of much more than 50 feet - the uniqueness of this place is a result of the many narrow water-created passageways and caves at the edges of the valley, which is half a mile wide at the entrance but tapers towards the north end, and has several side canyons which become quite narrow and enclosed. Besides rainwater, erosion is accelerated by climatic extremes; freeze-thawing cycles occur in winter when temperatures are often below zero, while the baking heat of summer, sometimes over 100°F, dries and cracks the rocks. 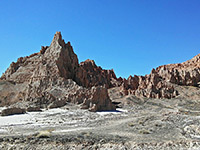 The scenic drive passes a self-pay fee station, information boards and a 22-site campground, and ends at a parking/picnic area near some of the main formations. 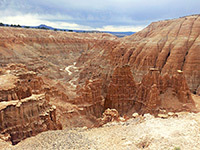 A short side road leads to another picnic area, closer to the edge of the gorge; brightly-colored cliffs and spires rise quite steeply ahead, with many narrow crevices at the edge; these are often only 2 or 3 feet wide but extend inwards for up to 100 yards, usually quite winding and with many side-branches. 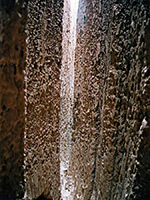 The walls tower high overhead and the effect is very much like being underground. 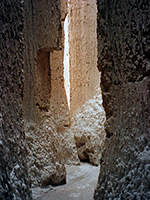 Most passages end abruptly, a characteristic feature of the rock, in a circular shaft with daylight visible far above; these mini canyons are formed when rainwater runs off the nearby land and is channeled down the shaft, and the 'caves' gradually erode further back into the cliffs. 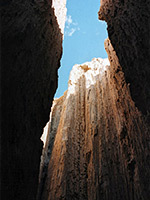 Several parts of the cliffs in Cathedral Gorge State Park have particularly fine formations but the north end is even more unusual. This area is reached by an easy one mile trail which links with an alternative northern entrance road to the park at Miller Point, an overlook with a fine view southwards over the valley. 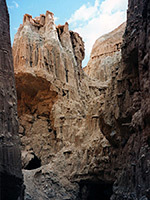 Here the main streamway branches and several forks wind through deep, narrow ravines, very much like slot canyons except that the softness of the rock often results in the flood waters eroding several passageways on different levels, forming short caves, abrupt elevation changes and strange surface textures. There is no official trail this far up the ravines, and some climbing is necessary to progress. A torch would be useful as some of the caves are sufficiently long and deep as to be completely dark. Near Miller Point, a 0.8 mile path heads southwest to Eagle Point, a similar though more secluded overlook. The only other extended trail in the park is the 3 mile (loop) Juniper Draw Trail that forks off westwards and leads towards more remote formations along the far edge of the main gorge, which continues another 2 miles to the north. 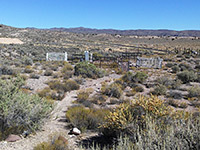 There is also one shorter route (0.2 miles) near the park entrance, to the old Bullionville Cemetery, the main relic from a small settlement established here in the 1870s.